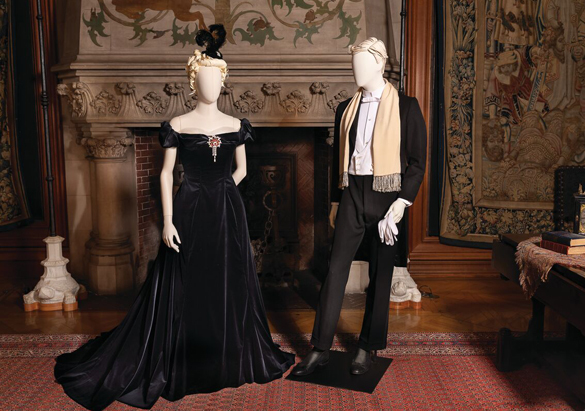 To create A Vanderbilt House Party, our Museum Services team worked with designer John Bright and his team at Cosprop, London, to recreate clothing worn by the Vanderbilts, including George and Edith’s ensembles from their engagement portraits. 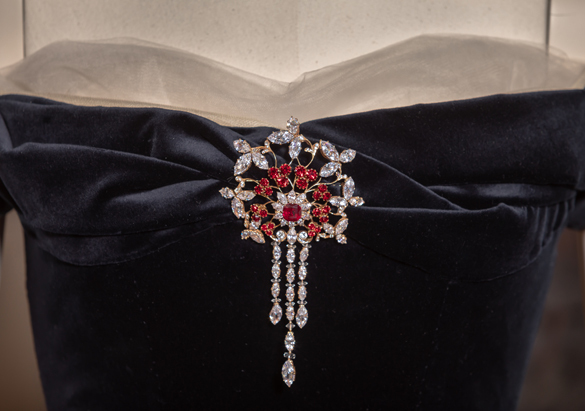 In addition to Edith’s striking blue velvet gown, there is another vital piece that completes her look in the archival photo: the diamond and ruby brooch George gave to her as an engagement gift. Our team decided that the elaborate piece simply had to be recreated in order to truly capture Edith’s look in the portrait. The first step for our team was to determine the jeweler that crafted the original brooch, which was part of a set that also included a choker necklace and tiara. One of our curators had a hunch that the piece resembled the work of Boucheron, a high-end French jewelry house established in 1858. 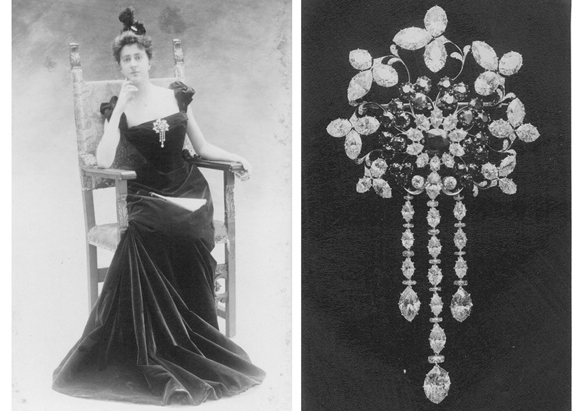 Boucheron’s company archivist was able to confirm that they indeed had a receipt of George Vanderbilt having purchased the set on May 7, 1898—just after his and Edith’s April engagement and prior to their June wedding. Luckily, Boucheron was also able to share with us the original 1898 photo of brooch from their archives, which turned out to be an incredibly helpful reference in the recreation of the piece. John Bright and the Cosprop team recommended artisan Martin Adams for the job. Martin specializes in making jewelry and jewelry-related props, including crowns, tiaras, regalia, and the like. In his 43 years of prop-making, Martin has worked on countless notable movie, television, and theater productions, including Game of Thrones, Harry Potter, Titanic, The Crown, Downton Abbey, Hamilton, and the list truly just goes on and on. Given the high demand and prestige of Martin’s work, our team considered themselves fortunate that he undertook the brooch recreation project—and that he gave it such time. We supplied him with Boucheron’s archival photo of the brooch, which captured its fine details, as well as our photos of Edith wearing it, which showed the brooch from various angles, displaying its depth. 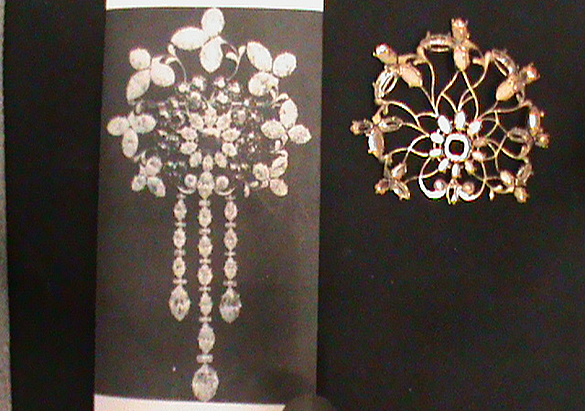 But in order to determine the actual size of the piece, the Cosprop team made photographic cut-outs of the brooch in various scales—under Martin’s direction—to see which size appeared to be most accurate against the backdrop of Edith’s gown as it, too, was being recreated. 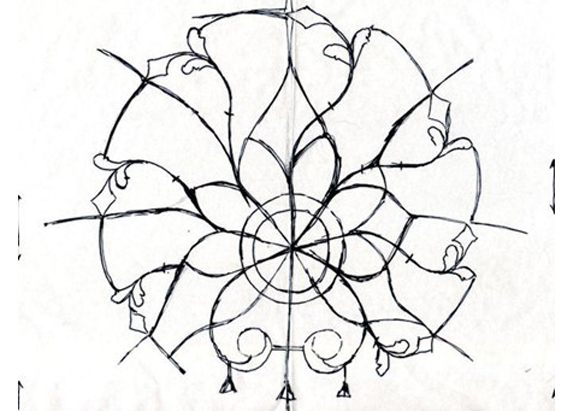 Martin then set to work on the frame of the piece, which he pierced from flat sheet copper. He filed the copper to give it steeply sloping sides, which gives the appearance of being delicate, while still maintaining its strength. The whole frame was them gently hammered over a dome-shaped block to give the brooch the correct dimension and depth. With the exception of two stones, all of the diamonds in the original brooch were boat-shaped stones, known as a marquise or navette cut. Martin estimated that the piece’s 46 diamonds were in five different sizes—from 6mm long (just under a quarter of an inch) to 14mm long (a bit more than half an inch). He chose to use cubic zirconia which, particularly for a piece that will be viewed closely, would provide a much better representation of diamonds than would foil-backed stones, which are commonly found in costume jewelry. As for the rubies, Martin obtained samples of the richest red stones available, including red cubic zirconia, synthetic rubies, and red paste stones—but none of them had deep enough color. He finally found just enough rich red Swarovski stones in the four main sizes he needed. However, Martin had to settle for using a synthetic ruby as the massive cushion-shaped stone in the center. Although to the trained eye the stone may appear a slightly lighter shade than the rest, he simply could not find a better alternative to fit the size. 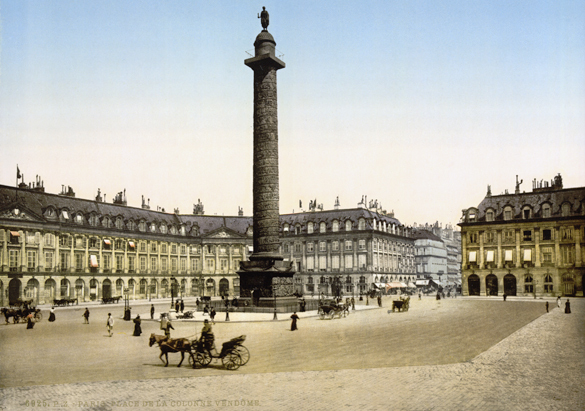 After a few failed attempts using ready-made stone-mounts, Martin realized he needed to make the mounts from scratch in order for the piece to be as authentic as possible. 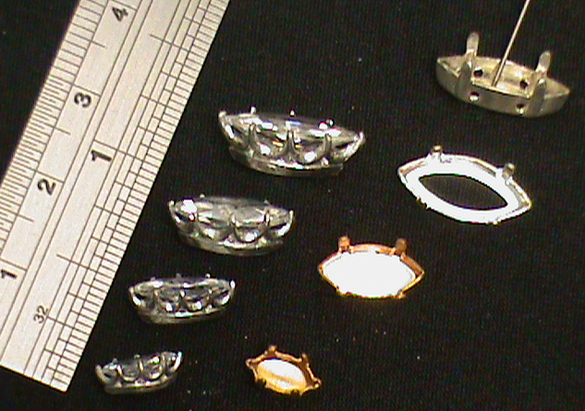 This required him to make 10 different mount models—the main body of the brooch consists of five different stone-mount sizes, there are four different joint mounts, and one mount just for the central stone. He used the models to make molds, from which he then cast each of the mounts. 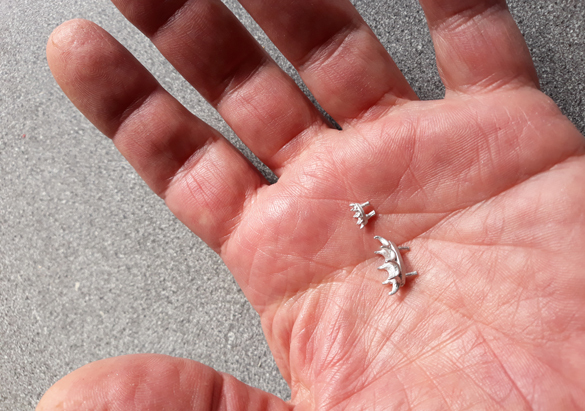 Martin's final challenge was to grind down and polish the 14 "diamond" wafers for the pendant sections, as nothing like this was available to buy. He then set all of the stones in their mounts individually. And after upwards of 200 hours of work, the brooch was complete. From start to finish, the entire process took nearly 8 months and the final result is nothing short of stunning. Having a recreation of this quality allows us to tell more of the Vanderbilts’ romance and courtship story through a tangible, exceptionally beautiful object. We are overjoyed that it is now part of Biltmore’s permanent collection. The brooch is on display in the Tapestry Gallery of Biltmore House now through May 27 as part of our A Vanderbilt House Party exhibition.